Stanley was born in 1978 in Louisville, Kentucky. In a small library, in the basement of his church, he first discovered his love of reading. Jules Verne, Mark Twain, J.R.R. Tolkien, H.G. Wells and C.S. Lewis spoke to him. They took him to faraway places and adventures under the sea. In 5th Grade, a Social Studies report on the events surrounding the ride of Paul Revere introduced him to his favorite time in history, the 18th century. Years later, while researching his genealogy, he rediscovered his old fascination with the 18th century. His focus upon Scotland, he began to study the period with avid interest. The idea for The Legend of Chip came when a Scottish cousin recounted an ancient myth about a man called Chips and his dealings with the Devil. It was a dark tale, but the premise intrigued him. That night, he sat and wrote the first chapter of what would become his first novel. Today, Stanley is proud to proclaim that, The Legend of Chip: The Legend Begins, is the first book in a series of novels surrounding the life and adventures of Christopher MacDougall. He thoroughly enjoyed writing the novel and is currently working on the second book of the series. He is also working on other works that encompass the “World of Chip” as well. 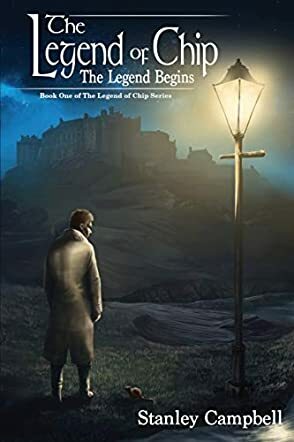 The Legend of Chip: The Legend Begins by Stanley Campbell is an inspiring story with a great historical setting against the backdrop of 18th century Edinburgh, Scotland. The reader follows the life of an ordinary man, Christopher MacDougall, whose sole interest is to cater to his family needs. But an encounter with a stranger changes everything. The opportunity offered by the stranger could have increased his income and made life easier for his family, but he is instead plunged into a series of unfortunate situations, with his life quickly spiraling out of control. Follow him as he sets out to find answers, leaving his family behind to join the Navy. When he comes back, things look messier than when he left them, with evil lurking in the dark and threatening not only his life but that of everyone he cares about. Does he have what it takes to make the choice that can save the lives of those he loves? Stanley Campbell’s novel is powerful, with great pacing, and is character-driven. The reader is plunged into the inner world of the protagonist, a restless man who is haunted by an evil he can’t understand. The story is intense, exploring emotions in the characters and deeper levels of the psychological conflict. The Legend of Chip: The Legend Begins features great prose with compelling descriptions and emotionally rich passages. The scenes are well-crafted, with awesome paragraph breaks that leave a strong dramatic effect on the reader. The author integrates powerful themes into the narrative, including family, service, and a man’s search for meaning. This is a well-plotted story with a huge potential to inspire and entertain readers. I will attempt to keep this short. This is really an awesome story, and I was totally blown away by it. I don't usually read Christian fiction, but I think I'll read some more, if this is the kind of quality some Christian novels have. You kept me on the edge of my seat whilst reading your story! I loved all your characters, especially Christopher, Captain O’Toole, and Mr. Prose. They really brought your story to life! It would be amazing to see the Devil become the primary antagonist in your next book. I literally can't thank you enough for allowing me to read your lovely story. You have a wonderful imagination, and I appreciate you sharing your vision. Congratulations on your first published novel! First off,I am a fan of period fiction.The Legend of Chip somewhat fits this criteria since it is set in 1742 Scotland. I found the book an easy read and a real page turner. I found myself reading it at every opportunity I had, sometimes to my own dismay,because I was not doing things I had set out to do. Stanley Campbell is a master storyteller . He is a cross between Charles Dickens and Dean Koontz, and Stephen King. I found this book a very good read. A fun and sometimes dark ,bleak look at life in 1742 when political and economic forces were not in the common man's favor. I would highly suggest anyone who likes adventure fiction with a historic setting, to get a copy of this book and settle in for a nice long winter weekend of enjoyable reading . I must admit that I was surprised by this book. I found the storyline to be impressive and unique for a first-time author. He has a talent for keeping the reader intrigued all the way until the end. Make sure to brew a pot of coffee before you begin, because you won't want to put it down! A friend of mine recommended this book. I'm not one to read first-time authors. I usually wait until they have at least two books published before I take the time to visit their worlds. To say the least, I was pleasantly surprised. The story grabbed my attention from the moment I read the first paragraph, and didn't relinquish its hold until I finished. The story is easy to follow and has many fun twists. I would compare it to Koontz's Odd Thomas in style, not genre. The ending left me waiting for more. Well done. So I literally just read this book in one day. This is brilliant! Nice to find a plot that not only is well written, but has a refreshing originality, too. Thank you so much for writing such an enjoyable story! Hoping book 2 comes out soon. This is a good book to read when you're curled up by a fire. Stanley does a good job of communicating his ideas. His scenic word pictures are well done and his descriptions of emotions and heart felt situations are impressive and moving. His deeply descriptive methodology easily draws readers into the story and the characters. The reader can quickly begin to identify and even sympathize with the characters on a personal level. I was also somewhat impressed with portions of this book where Stanley showed his ability to stay within the rougher English phrasing he chose for certain characters. And, if you want a book that makes you feel like you are actually part of an older time world, this is the one. An enjoyable read. The story certainly had some twists I did not expect. It was exciting because I personally know the author and his family. It reminded me of a friend who would respond to adversity with "it is what it is". I look forward to the next book. Congratulations Stan. Clean and enjoyable read. Truly captures your attention and takes you on an adventure in bonny ole Scotland!